The Public Procurement Authority (PPA) is a public entity in the State of Oregon formed by an Intergovernmental Agreement pursuant to Oregon Revised Statutes Chapter 190 (Intergovernmental Cooperation). The PPA became effective in August, 2013 and is comprised of three participating agencies which are Oregon fire protection districts: Tualatin Valley Fire & Rescue, Jackson County Fire District No. 3, and Redmond Fire and Rescue. The PPA is governed by a four person board of directors, three voting members including a member of each participating agency and a non-voting member who is an executive of the Western Fire Chiefs Association. The PPA was formed to provide procurement opportunities to its members as well as members participating in the National Purchasing Partners (NPPGov) national cooperative purchasing program. State statutes generally allow government entities to use contracts that have been competitively solicited by a different government entity even if it is in a different state. Both parties must enter into an Intergovernmental Cooperative Purchasing Agreement which has been executed by the PPA and is available to all NPPGov members. The League of Oregon Cities is a governmental entity formed by an intergovernmental agreement by Oregon’s incorporated cities. The League was created when representatives of 25 cities gathered in Portland on January 24, 1925. Salem Mayor J.B. Giesy was elected president, and the other elected officers were: Portland Commissioner of Public Works A.L. Barbur (first vice president); Eugene Mayor E.B. Parks (second vice president); and Gresham Mayor Charles Cleveland (treasurer). The group adopted a legislative program that called for submission of a constitutional amendment that would guarantee cities in Oregon full control of their own affairs and restricting legislative interference with the home rule prerogatives of other cities. Today, the League brings city officials together from around the state and the result is a unified, powerful and influential force. All in an effort to foster pride and ownership. Gahanna was founded along the Big Walnut Creek in 1849 by John Clark of Ross County from 800 acres of land that his father, Joseph Clark, had purchased from Governor Worthington in 1814. Clark named his property the Gahanna Plantation, from which the City of Gahanna derives its name. Gahanna maintained a considerable rivalry with the town of Bridgeport. Located directly across Granville Street from Gahanna and also along the banks of the Big Walnut Creek, Bridgeport was founded in 1853 by Jesse Baughman, a former Franklin County Commissioner. The two towns eventually put aside their differences and merged into one. They adopted the name Gahanna as there was already another town of Bridgeport in Ohio. In March of 1881, 55 citizens of Gahanna petitioned Franklin County to incorporate the village. The incorporation was granted in June and was recorded on August 8th, 1881. The Village then held its first mayoral election and on October 6, 1881, swore in its first mayor, L. John Neiswander. 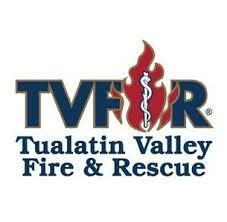 Tualatin Valley Fire & Rescue took shape between 1972 and 2004, as a number of small fire departments consolidated to increase efficiency, lower the cost of services, and eliminate duplication. It’s because of these consolidation and annexation efforts that TVF&R has one of the lowest tax rates in the region. We recognize that we are accountable to the public we serve and will be good stewards of the finances and resources entrusted to us. We will conduct ourselves in a manner that brings credit to the organization and the fire service while both on and off duty.